As winter weather sets in, the heat kicks on in New York City's approximately one million buildings. Most of these buildings' furnaces or boilers run on fossil fuels such as natural gas and oil; as a result, heating and hot water account for about 42 percent of the city's total greenhouse gas emissions. Vijay Modi, a professor in the Department of Mechanical Engineering at Columbia University and an Earth Institute faculty member, and his research group are studying how to decarbonize heating. His solution? Heat pumps that run on electricity—because as more and more electricity is sourced from renewable energy, "it is much easier and affordable to make electricity green than to make a green fuel." "Policy makers have recognized the value of heat pumps," he said, "And they are part of the New York State governor's energy efficiency goals—that by 2030, we should have 25 percent of the heating from heat pumps." Electrified heating is important for the rest of the nation, too. To avert the catastrophic impacts of climate change, we must reduce our carbon emissions to zero as soon as possible. According to a 2018 report by the Rocky Mountain Institute, reaching "deep decarbonization" goals of reducing greenhouse gas emissions 75 percent or more will entail, among other measures, eliminating most of the emissions produced by the burning of natural gas, oil or propane in American homes and businesses for heating and hot water. 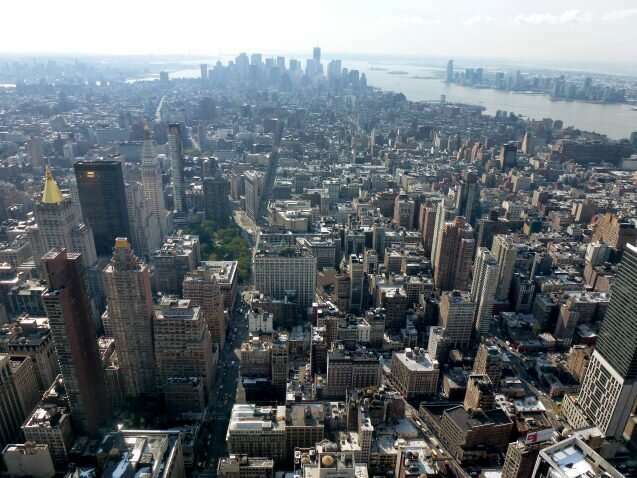 Decarbonizing heating in New York City is challenging because of the city's density, huge demand for energy, aging infrastructure, variety of building types, and space constraints. Modi's Quadracci Sustainable Engineering Lab is researching how it might be done, studying the benefits of electrifying heating, and addressing potential issues that could arise. There are concerns about what might happen if more and more electricity is needed for heating in the winter. System-wide electricity demand currently peaks in the summer with the use of air conditioning; Modi maintains we have the capacity to grow heat pump use until we reach a comparable winter peak. Getting there and beyond, wind resources could provide a solution. "We have very good off-shore wind resources right here in New York City," said Modi. "It is a very good match for the heating, as we get stronger winds in the winter that would allow an increasing amount of heat to come from wind power." Another issue is that the electrical wiring of many buildings may not be able to accommodate the extra electricity needed by heat pumps, which run on 220/240 volts. Modi suggested that window unit air conditioners that run on 220/240 volts could be replaced by heat pumps (which also cool). "For most of your heating, when it's above freezing, you may be fine," he said. And in New York City, at least, "that may be what 60 percent of the heating need is. In addition you would be reducing emissions too." According to Forbes, "The global economy of the future is going to be driven by electricity and heated/cooled by electricity—not just powered by it." "It may very well be that in the next 20 years, we will figure out how to make all electricity green and cheap all the time. Then we'd use heat pumps all the time," said Modi. "But the pathway to doing that is tricky—as we make this transition, it has to be cost-effective." For new home construction, the NRDC study determined that in California, installing electric heat pumps instead of natural gas systems could save homeowners $1,500 upfront, and hundreds of dollars each year in operating costs. But since the initial costs to install or retrofit heat pumps may discourage some people from making the switch, utilities, governments, and manufacturers need to promote heat pump technology and make it more affordable. Financial incentives are key. "We are giving very big incentives to buy an electric car," said Modi. "But dollar for dollar, it would be much better to do it for heating…because the emissions reduction would be very significant for the same amount of money."